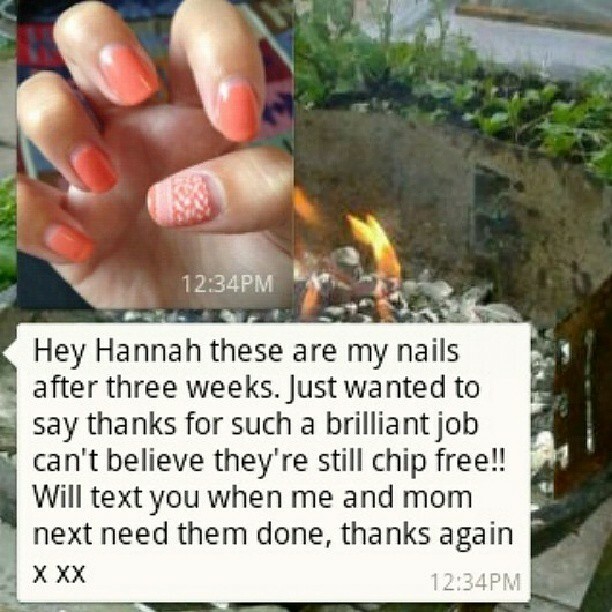 Hannah is a brilliant beauty therapist and made me feel so relaxed in the comfort of my own home. I would defiantly recommend to family and friends as the treatment provided was amazing and I seen real results. "Hannah provided a very professional service on my wedding day to ensure myself and bridesmaids looked good for my special day. The trial before the day proved to be a real benefit as one of us suffers from severe allergies. 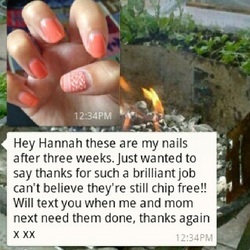 I got many compliments on the day about my make up and the images picked up the colours hannah had used perfectly"
I have been very thrilled with my nails since Hannah started doing them. After biting them for years and now recently stopped she has transformed them. I love experimenting with the different colours in shellac an gelish also had minx gold lightening this time and they look great. Hannah is very professional. great job I am very pleased with them. would cost and also can we make an appointment for Friday 1st March if possible. I spent a lot of time sourcing and trialing a number of make-up artists for my wedding in September 2012. Hannah was the only artist that truly took the time to understand exactly who I was, what I wanted and how I wanted to look on my wedding day. Hannah was so professional and before she even started to make-up my face she researched a number of different looks with me first. I am of West Indian descent so it can be difficult to find a make-up artist that understands the complexities of dark skin. Not only was Hannah knowledgable in all skin types she really understood how to make up my face to bring out my best points! The trial was so successful that both my Mother and Maid of Honour signed her up once she had finished my face!! On the Wedding day Hannah was calm and professional and recreated the makeup she has created at my trial and she madeup my Mother and Maid of Honour. I cannot recommend Hannah enough, she was fantastic. I would happily recommend her to any future Brides to be, Bridesmaids or Mothers of the Bride or Groom. We love to hear feed back from you to improve our experience you had with our services, Please review your comments below. Thank You!